I just read, “And Two Boys Booed” by Judith Viorst and illustrated by Sophie Blackall, published by Margaret Ferguson Books. I really enjoyed the repetitive story, narrated by the young boy who is waiting his turn to perform at the class talent show. The repetition builds and builds just as the tension of the little boy builds and builds. But this book has something that most picture books don’t have— Sophie Blackall has also incorporated lift-up flaps. They are there to add fun and surprise. For instance, we can lift up the boy’s pants pocket and see its amusing contents. At the end we can clap the teacher’s hands together. Yaaaayyyy, clap clap— this book is lovely! But while these flaps add artistically to the book, they are not part of any ‘necessary’ interaction or instruction. 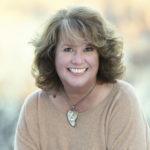 I have read several articles that credit the fabulous author/illustrator Eric Hill, author of the “Spot” books for the invention of the ‘lift the flap’ book. Although it is true that he made this feature mainstream and wildly appealing to masses of children, lift-the-flap, or “moveable” books have been around since Victorian times. 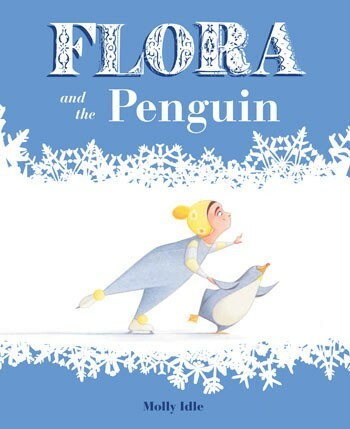 And then there is Molly Idle’s hugely popular “Flora and the Flamingo” and her most recent, “Flora and the Penguin” books, published by Chronicle Books. Both of these wordless picture books rely on turn-over flaps to artistically convey the animated feeling of dance and movement between her characters. Could all these books have been illustrated without the flaps? Yes, they could have. But having the interactive flaps lets us learn more about the characters and uncover secret surprises. 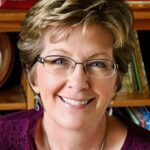 For Molly Idle’s books they act as a unique animation tool. I thought it was unusual to have two picture books on our libraries “New” shelf with lift-up-flaps. The lift up flaps certainly add some lovely layers and interest to their books. But they also add production cost as well. I applaud the vision of these illustrators for thinking outside the box and off the flat page. But I also send a cheer and a fist bump to the publishing houses that are willing to put the extra money into making an extra special picture book. 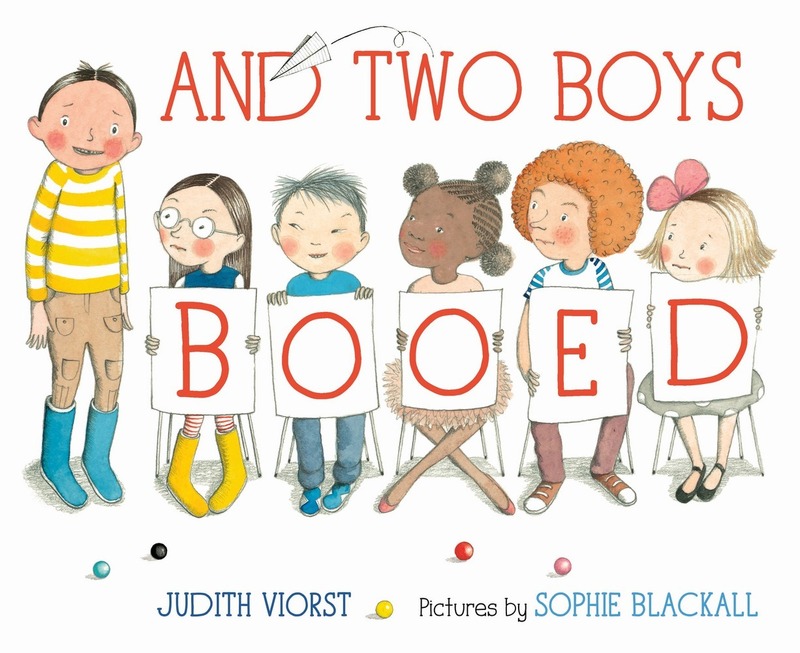 And Two Boys Booed, Eric Hill, Flora and the Flamingo, Flora and the Penguin, Jennifer Black Reinhardt, Judith Viorst, Lift-the-flap books, Molly Idle, Sophie Blackall, Spot. Bookmark. Ah, this brings back memories of some beloved books — The Wheels on the Bus and a Carl (the Rottweiler) book — that had all sorts of things to lift, pull and slide. They weren’t long-lived, alas, but they were loved. Haven’t seen this new one by Judith Viorst, but I’ll need to reserve it–I love Sophie Blackall’s work! Thanks Jill and Linda— I read a post by Sophie Blackall and she spoke about making the book. She said she loved the tactile quality of having flaps and felt that the more ripped, folded, they got, the better! Meaning that the book was very well-read and loved! Great post! I love clever flaps that add fun. Just wanted to mention that Judith Viorst is 83 and, IMO, doing some of her very best work. (I hope that’s me at 83! Not the fame part–although would that be cool or what?–but doing my very best work.) I can’t wait to get this book because I loved Sophie Blackwell since I saw Ivy & Bean.. Thanks, Jennifer! Thank you, Charlotte! Here’s to awesomeness at 83, and beyond!